A fast and clever half forward flanker, Pat Hartnett was one of the most decorated Tasmanian footballers of the 1930s. Born in St Helens in 1910, Hartnett was playing senior football for St Helens by the time he was 16, and later played a season with Ringarooma in the old North-East Association in 1928. 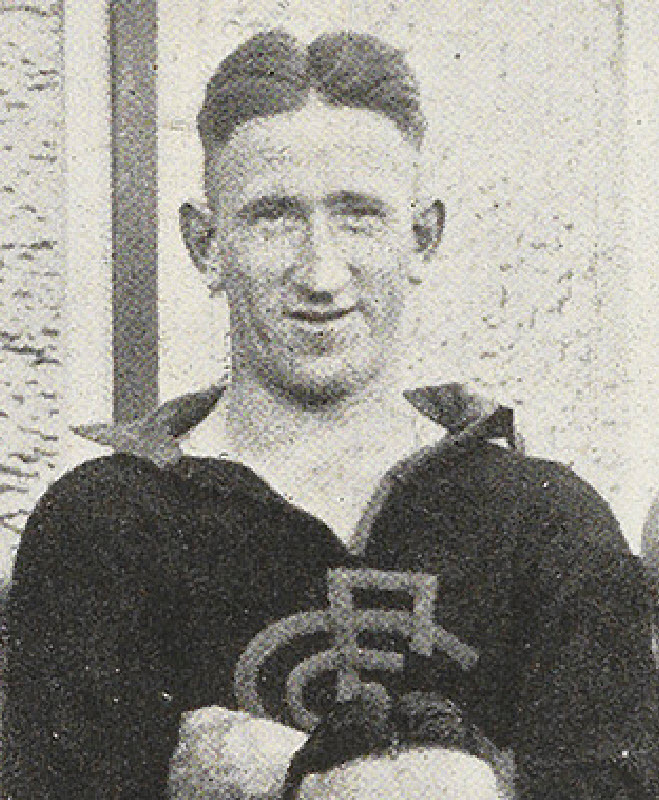 His senior career began with North Launceston in 1929, where he won the senior Best and Fairest award in his first season as a 19-year-old. The following season he crossed to Victoria to join St Kilda, but after only three games for the year he returned to Tasmania and to North Launceston. After missing the Robins’ 1931 premiership, Hartnett headed south to Hobart to play with Cananore, and it was here that his star began to burn brightly. His 1932 season was a great success and he took home the Canaries’ Best and Fairest award that year; however, he found himself on the wrong end of two further results featuring North Hobart at season’s end. He was a member of Cananore’s losing TANFL grand final team against the Redlegs, and while he tied with Len Pye in the William Leitch Medal count, he lost the award on a count back, although was posthumously awarded the medal years later in 1996. 1933 brought the only premiership of Hartnett’s senior career as Cananore avenged their previous year’s defeat, again opposite North Hobart. That season also saw Hartnett represent his home state at the 1933 National Carnival in Sydney, and it was his performances there that led St Kilda to approach him to return to the VFL, which he did. This second stint in the VFL was far more successful than his first, with Hartnett appearing 65 times for the Saints from 1934-37, performing well enough to poll 26 Brownlow votes during the period. 1935 was by far Hartnett’s best season in the VFL: he played 16 games, kicked 22 goals, polled eight Brownlow votes and played his only representative matches for the VFL. In one of these games he gathered 28 disposals, took 13 marks and kicked 6.3 in Victoria’s 91-point hammering of South Australia at the Adelaide Oval, easily being named one of his side’s best. At the end of 1937 Hartnett requested a clearance to VFA side Sandringham, however St Kilda were reluctant to acquiesce and it took until May the following year for the clearance to be approved. Hartnett would play 11 games for the Zebras before joining Brighton for the 1939 season, another outstanding year for Hartnett in which he won the Recorder Cup as the VFA’s Best and Fairest player. Hartnett would continue with Brighton until the end of the 1941 season when the VFA went into recess due to World War II, ending Hartnett’s career in top-flight football. Hartnett enlisted in the military during World War II, serving with the 51st Australian Garrison Battalion as a guard at Italian prisoner of war camps around Myrtleford, Victoria. Whilst enlisted he continued to play football for an Army team in a Sunday league around Albury. He was discharged in 1946 and died in 1990 at the age of 80.